This article is about the ancient portion of Anatolia. 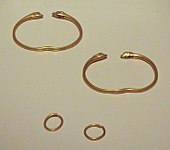 For Galatai or Galatae, see Gaul. For other meanings, see Galatia (disambiguation). The Galatians (Ancient Greek: Γαλάται, Galátai; Latin: Galatae, Galati, Gallograeci; Greek: Γαλάτες, Galátes, "Gauls") were a Gallic people of the Hellenistic period that dwelt mainly in the north central regions of Asia Minor or Anatolia, in what was known as Galatia, in today's Turkey. In their origin they were a part of the great migration which invaded Macedon, led by Brennus. The originals who settled in Galatia came through Thrace under the leadership of Leotarios and Leonnorios c. 278 BC. They consisted mainly of three tribes, the Tectosages, the Trocmii, and the Tolistobogii, but they were also other minor tribes. They spoke a Celtic language, the Galatian language, which is sparsely attested. In the 1st century AD, many Galatians of the Roman Empire were Christianized by Paul the Apostle's missionary activities. The Epistle to the Galatians by Paul the Apostle is addressed to Galatian Christian communities and is preserved in the Bible (i.e. the New Testament). Original location of the Tectosages in Gaul. Seeing something of a Hellenized savage in the Galatians, Francis Bacon and other Renaissance writers called them "Gallo-Graeci", "Gauls settled among the Greeks" and the country "Gallo-Graecia", as had the 3rd century AD Latin historian Justin. The more usual term in Antiquity is Ἑλληνογαλάται (Hellēnogalátai) of Diodorus Siculus' Bibliotheca historica v.32.5, in a passage that is translated "...and were called Gallo-Graeci because of their connection with the Greeks", identifying Galatia in the Greek East as opposed to Gaul in the West. Brennus invaded Greece in 281 BC with a huge war band and was turned back before he could plunder the temple of Apollo at Delphi. At the same time, another Gaulish group of men, women, and children were migrating through Thrace. They had split off from Brennus' people in 279 BC, and had migrated into Thrace under their leaders Leonnorius and Lutarius. 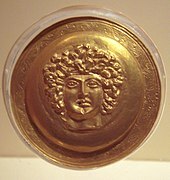 These invaders appeared in Asia Minor in 278–277 BC; others invaded Macedonia, killed the Ptolemaic ruler Ptolemy Ceraunus but were eventually ousted by Antigonus Gonatas, the grandson of the defeated Diadoch Antigonus the One-Eyed. The invaders came at the invitation of Nicomedes I of Bithynia, who required help in a dynastic struggle against his brother. Three tribes crossed over from Thrace to Asia Minor. They numbered about 10,000 fighting men and about the same number of women and children, divided into three tribes, Trocmi, Tolistobogii and Tectosages. They were eventually defeated by the Seleucid king Antiochus I, in a battle where the Seleucid war elephants shocked the Celts. While the momentum of the invasion was broken, the Galatians were by no means exterminated. 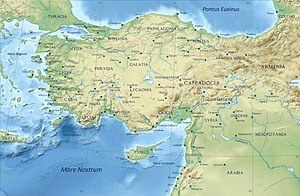 Instead, the migration led to the establishment of a long-lived Galatian territory in central Anatolia, which included the eastern part of ancient Phrygia, a territory that became known as Galatia. There they ultimately settled, and being strengthened by fresh accessions of the same clan from Europe, they overran Bithynia and supported themselves by plundering neighbouring countries. The Galatians invaded the eastern part of Phrygia on at least one occasion. The constitution of the Galatian state is described by Strabo: conformably to custom, each tribe was divided into cantons, each governed by a chief ('tetrarch') of its own with a judge under him, whose powers were unlimited except in cases of murder, which were tried before a council of 300 drawn from the twelve cantons and meeting at a holy place, twenty miles southwest of Ancyra, written in Greek as Δρυνεμετον (Drunemeton or Drynemeton, Gaulish *dru-nemeton "holy place of oak"). It is likely it was a sacred oak grove, since the name means "sanctuary of the oaks" (from drus, meaning "oak" and nemeton, meaning "sacred ground"). The local population of Cappadocians were left in control of the towns and most of the land, paying tithes to their new overlords, who formed a military aristocracy and kept aloof in fortified farmsteads, surrounded by their bands. These Galatians were warriors, respected by Greeks and Romans (illustration, below). 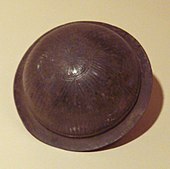 They were often hired as mercenary soldiers, sometimes fighting on both sides in the great battles of the times. For years the chieftains and their war bands ravaged the western half of Asia Minor, as allies of one or other of the warring princes, without any serious check, until they sided with the renegade Seleucid prince Antiochus Hierax, who reigned in Asia Minor. Hierax tried to defeat Attalus, the ruler of Pergamon (241–197 BC), but instead, the Hellenized cities united under Attalus's banner, and his armies inflicted several severe defeats upon them, about 232 forcing them to settle permanently and to confine themselves to the region to which they had already given their name. The theme of the Dying Gaul (a famous statue displayed in Pergamon) remained a favorite in Hellenistic art for a generation. Their right to the district was formally recognized. The king of Attalid Pergamene employed their services in the increasingly devastating wars of Asia Minor; another band deserted from their Egyptian overlord Ptolemy IV after a solar eclipse had broken their spirits. In the early 2nd century BC, they proved terrible allies of Antiochus the Great, the last Seleucid king trying to regain suzerainty over Asia Minor. In 189 BC, Rome sent Gnaeus Manlius Vulso on an expedition against the Galatians, the Galatian War. He defeated them. 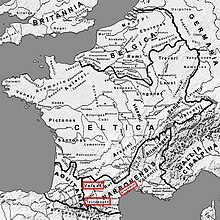 Galatia was henceforth dominated by Rome through regional rulers from 189 BC onward. Galatia declined and fell at times under Pontic ascendancy. They were finally freed by the Mithridatic Wars, during which they supported Rome. In the settlement of 64 BC, Galatia became a client-state of the Roman empire, the old constitution disappeared, and three chiefs (wrongly styled "tetrarchs") were appointed, one for each tribe. But this arrangement soon gave way before the ambition of one of these tetrarchs, Deiotarus, the contemporary of Cicero and Julius Caesar, who made himself master of the other two tetrarchies and was finally recognized by the Romans as 'king' of Galatia. Each tribal territory was divided into four cantons or tetrarchies. Each of the twelve tetrarchs had under him a judge and a general. A council of the nation consisting of the tetrarchs and three hundred senators was periodically held at Drynemeton. 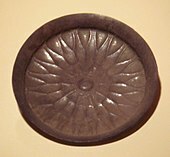 Comparatively little is known about Galatian religion, but it can be assumed that it was similar to that of most Celts. The Greek god Telesphorus has attributes not seen in other Greek gods, and it is speculated to have been imported from Galatia. ^ Pliny. Natural History, 5.42. ^ a b c d e f Prifysgol Cymru, University of Wales, A Detailed Map of Settlements in Galatia, Names and La Tène Material in Anatolia, the Eastern Balkans, and the Pontic Steppes. ^ Henri Lavagne, Les Dieux de la Gaule romaine, Luxembourg, 1989.